If you've ever been to Long Island City (LIC), then you'd have notice the ubiquitous galleries and art centers forming within the last three decades or so in this Queens neighborhood--which like its Brooklyn counterpart, Williamsburg--is also just about 20 minutes away from Manhattan. The Noguchi Museum opened in 1985, and is housed in a converted industrial building--flanked between some graffitied structures and a giant Costco. 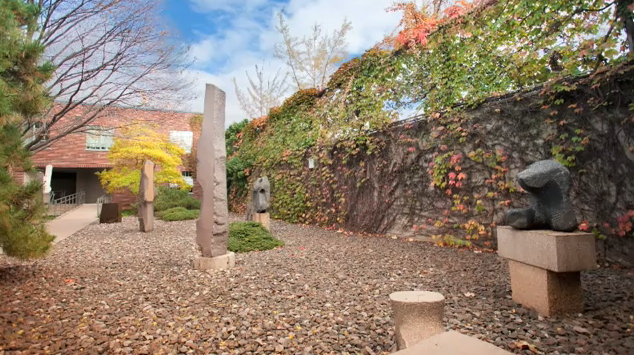 The Japanese-American artist/painter/sculptor/designer Isamu Noguchi (1904–1988) created his nearly hidden oasis of a gallery--where most of his works are currently housed--and is enclosed within the confines of an ultra serene Japanese garden that he designed himself (left). 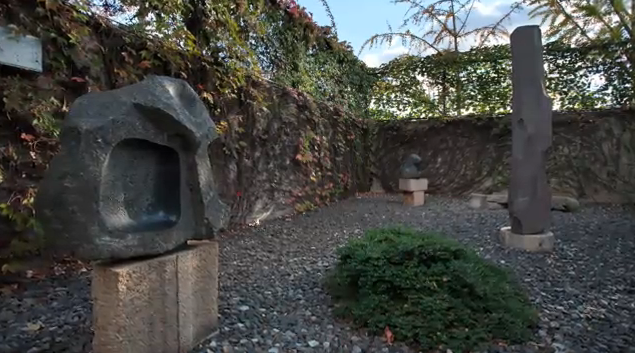 Noguchi’s museum, considered by some to be one of his greatest works, was a founding member institution of the Long island City (LIC) Cultural Alliance. A calming experience at the Noguchi Museum is an invitation to what Noguchi called a “conversation with the stones." In the museum’s large unique stone gardens (as pictured above), there's a massive piece of sedimentary stone, layered by cutting across and into the layers. The surface was hard smooth gray, followed by a mellow orange stone. 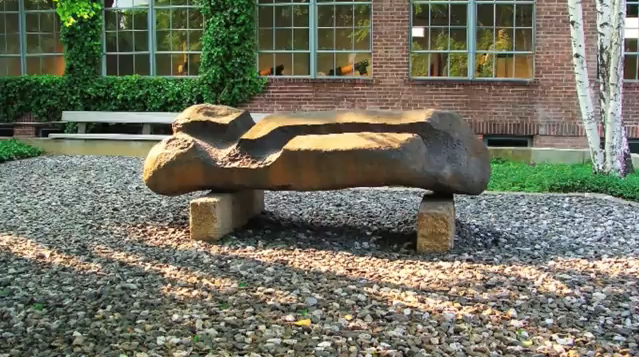 Where as inside the museum, independent curator Amy Wolf calls the Noguchi exhibition as, “A comprehensive survey of Isamu Noguchi’s most important artistic relationships with influential figures in art, dance, architecture and design.” (For more impressions of the Noguchi Museum, see video [featured right] via the Teen Advisory Board (TAB) program at the Noguchi Museum, LIC). 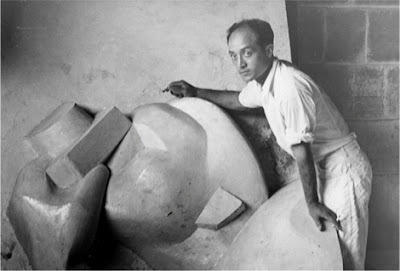 The genius of Noguchi (pictured left), is said to have opened the door to “modernism,” and indeed his work still appears to us today as undeniably “modern” in 21st century terms--spare and clean--yet crafted out of natural materials. From small intimate light works for the home to large-scale public pieces of art, Noguchi’s creations broke new ground. His iconic designs are Japanese, as well as Western; ancient yet classically representing the present and the future. Noguchi’s art and architecture has become part of the design “language.” In fact, just this weekend, a version of the Noguchi Akari Lamp (pictured right below) designed for Vitra was featured on T Magazine's: Live a Little: Spring Design. Like his Freeform Couch (pictured right below), (which he also designed for Vitra), both Noguchi designs become immediately recognizable. 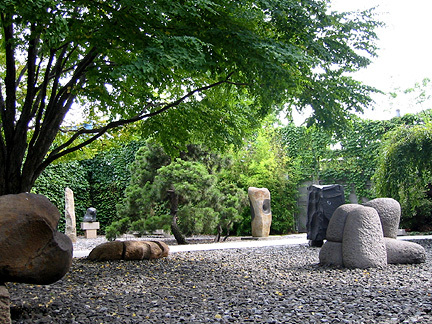 Visitors of the Noguchi Museum have the opportunity to experience Japanese cultural heritage in the beauty of standing stones; the effusion of white light and the archaic stillness of Japanese Haniwa ceramic pieces (3rd to 4th c. AD), may recall to ones mind not just the centuries of enduring esthetic of Japanese design traditions, but also the resilience of Japan-- and its strong spirit called Yamato-damashii: "the brave, daring, and indomitable spirit of Japanese people."